About an hour from the city, Bangsai Country Club has unfortunately gained a reputation for accommodating large, loud groups of tourists from one of Asia's most technologically advanced nations who's lady golfers are dominating the LPGA Tour. 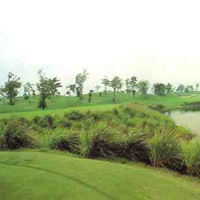 The course is quite short from the whites, but has a number of excellent risk-reward golf holes that if maintained properly, would make it one of the best in Bangkok. Green fees are a measly 450 baht weekdays, and if you tee off in the morning, you should enjoy a relatively quiet and quick round. Everything is what you expect for 450 baht, so as long as you go with the right attitude and don't expect too much, a great days golfing is to be had.